Ok, this is my first post so be gentle! I found this little gem of a drink in my local Morrisons for only £1 a bottle, never tried it before but the bottle pulled me in. Ive had better lagers but not many, and certainly not for this price. 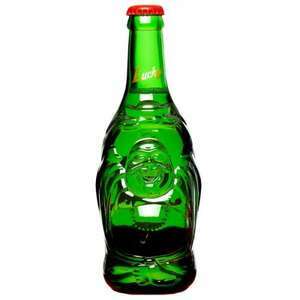 Worth a punt, even of its just to rub the belly of the Buddha! It's a magic bottle, and the beer ain't half bad neither! I remember Wetherspoons flogging this for £1 a bottle not long back, i soon found out why, rancid! tastes crap.. paid 39p in B&M's and got ripped off! Tried some and was not impressed, found it rather insipid. However, judging by the continued success of carling, fosters, bud, carlsberg etc this might be enjoyed by quite a lot of people. Deal posting newbie! This is scorpiofc first deal post. Help out by leaving a posting tip or just to show your appreciation for their contribution.